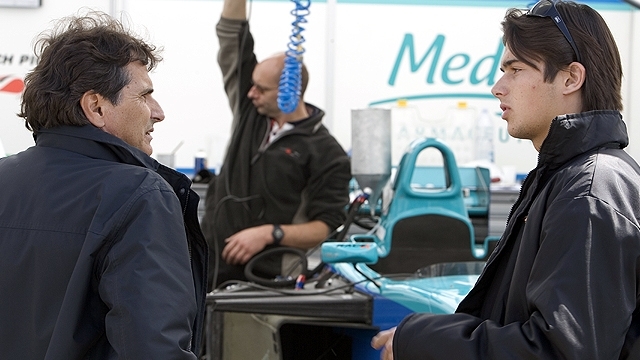 Nelson Piquet Jr and his ex-champion father Nelson Piquet have finally won their libel case over Renault. They were a part of the controversial "Crashgate" affair and were accused of lying by Renault in this controversy.Renault also on their official website have confirmed the news that they had been falsely accused both of them. In a press release in September 2009 , Renault had claimed that Piquet Jr. had delibrately crashed the car at the 2008 Singapore Grand Prix. Piquet Jr. In response to it he had stated that he delibrately did that on the instructions of the team bosses so as so save his teammate Alonso to win the race. Now after the case has been finally solved, the verdict by the World Motor Sport Council was a shocker in which Renault was handed over a two year F1 suspension, allowing the pair to sue for libel in the British courts.The managing director Flavio Briatore and executive director of engineering Pat Symonds both banned from F1.Renault has agreed to pay what it calls 'substantial' damages to former driver Nelson Piquet Jr. and his father over allegations. Renault after admitted of libelling the duo , made a statement: "The team accepts -- as it did before the World Motor Sport Council -- that the allegations made by Nelson Piquet Junior were not false. "It also accepts that Mr Piquet Junior and his father did not invent these allegations in order to blackmail the team into allowing him to drive for them for the remainder of the 2009 season. "As a result, these serious allegations contained in our press release were wholly untrue and unfounded, and we withdraw them unequivocally. "We would like to apologise unreservedly to Mr Piquet Junior and his father for the distress and embarrassment caused as a result. Piquet's attorney in his response said:"They were both treated appallingly by Renault F1 when they dared to reveal the scandal to the governing body, and Nelsinho was abused terribly throughout his absurdly short career in F1," Crossley said. "It is to the immense credit of both my clients that they have refused to be deterred from righting the wrongs despite the ferocity of the attacks and the size of the opponents they have had to confront. "Nelson Piquet dominated F1 during the early 80s and his reputation as a motorsport legend should remain untarnished by this saga." So it is hoped with a positive notion that , they Piquet Jr. would continue to race, and both of them still happen to lead normal lives free of accusation. Congratulations for the recognition and own domain name.